Revision note: We have added information about the P-Vine Special LP, on which much of the Dozier Boys' United output was reissued or issued for the first time, and about Aristocrat 3001, the group's first release under its own name. 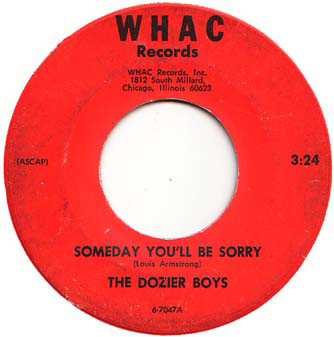 The Dozier Boys were a long-lived vocal/instrumental group. They originated on the near North Side of Chicago around 1946 and disbanded in 1970. They made a number of appearances on television, and they recorded for several different labels between 1948 and 1964. The Dozier Boys began as the Four Tones, singing gospel music at Waller High School. The original members were Lucius Teague (lead vocals); Eugene Teague (baritone, guitar, arranger); Cornell Wiley (first tenor, string bass); and Benny Cotton (bass vocals). For a few months, they had their own 15-minute radio show on a station in Hammond, Indiana. 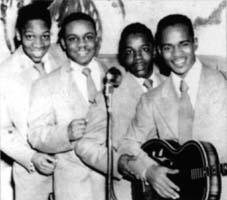 In 1947, the Four Tones met the Four Vagabonds, whose lead singer John Jordan gave them training in singing pop tunes. Lucius Teague left to study dancing and acting (he ended up joining the army, where he served for 30 years) and was replaced by Bill Minor (a lead tenor and drummer). Cornell Wiley's stepfather Cyrus Dozier, a druggist, gave them financial support and encouragement; the group was renamed The Dozier Boys in his honor. Although Teague and Wiley wrote songs of their own, the Dozier Boys were best known at the time for singing standards, especially ballads. They hit the amateur shows in Chicago until they were no longer allowed to compete because they had won too often. The Dozier Boys did well with club bookings. In early October 1948, a Defender ad had them at The Corner (formerly Martin's Corner) at 1900 West Lake Street, where they shared the bill with Jump Jackson and his Combo and Kenneth Tibbs (the older brother of Andrew Tibbs). They worked the Beige Room (the basement club in the Pershing Hotel) on several occasions from the fall of 1948 to mid-1950. (This is the same club that was called Birdland and then Budland in the mid-1950s.) From October through December 1948, Eugene Wright had his Dukes of Swing (an 11-piece band) in the Beige Room (during part of this period, Wright simultaneously led a larger band upstairs in the Pershing Ballroom). The Dozier Boys become the official vocalists for the Dukes. Except for Eugene Teague's guitar, the Doziers don't seem to have brought their instruments to the Mallard date, and the same applies to their performances with the Dukes. However, with Andrew Tibbs they appear to have played their own instruments. The Dozier Boys were out of the same string-band tradition as the original Four Blazes, and none of the original members of the group played piano. On the dates on which they played as well as sang, the custom was to add a session pianist. On this occasion, it turned to be Sonny Blount (better known to posterity as Sun Ra). Sonny Blount was already well known to the Doziers from their nights at the Beige Room, where he was serving as music director for the Dukes of Swing. Accompaniment really by the Dozier Boys and Sonny Blount. From the collection of Tom Kelly. Andrew Tibbs (voc); The Dozier Boys: Eugene Teague (tenor voc, eg, arr); Cornell Wiley (lead tenor/baritone voc, b); Bill Minor (lead tenor voc, d); Benny Cotton (bass voc); Herman "Sonny" Blount (p). Universal Recording, Chicago, late November, 1948. Aristocrat 1105 was a 78 rpm single, released in December 1948 (it was reviewed in Cash Box on February 12, 1949). Aristocrat 1106 was released in July 1949. The unissued items are as identified by Leadbitter, Fancourt, and Pelletier, Blues Records 1943-1970 L-Z (published 1994). The usual caveats about data in the Aristocrat master book apply. 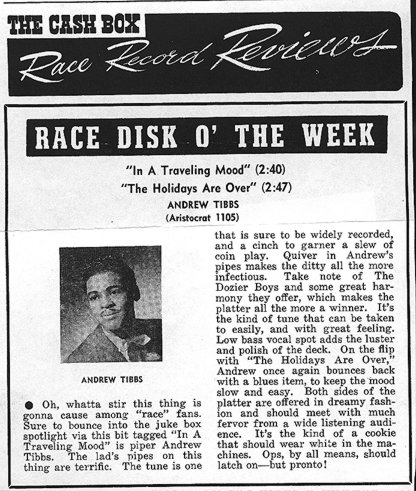 The two issued sides got their first ever reissue in February 2002, on Classics 5028, Andrew Tibbs 1947-1951..
From the collection of Dr. Robert Stallworth. We identified the lineup by ear, with help from Benny Cotton and Cornell Wiley. Though the label to Aristocrat 1105A credits Andrew Tibbs and "The Dozier Boys" with Sax Mallard's Combo, in fact Sax Mallard's group appeared only on the flip side ("The Holidays Are Over"). There are no horns on the A side, just the Doziers harmonizing and playing their instruments. 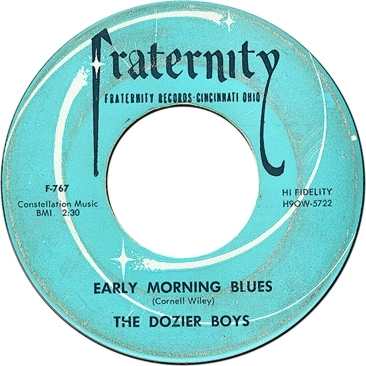 The Doziers used a session pianist for dates like this; Wiley and Cotton have stated that Sonny Blount helped out on this occasion. On "Traveling" and "Every Man's," Benny Cotton shares the lead vocals with Tibbs. 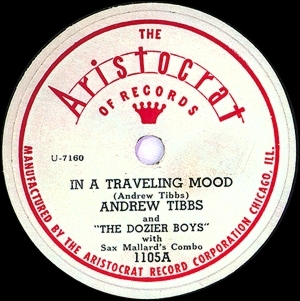 On Aristocrat 1106, the singer is referred to as "Andy Tibbs." Sax Mallard's band did back Tibbs at a separate session shortly before this one, which provided Aristocrat 1105B and 1106-B. According to Jay R. Monroe, Aristocrat 1105 has been reissued on a bootleg "repro." The "repro" uses a facsimile of the Aristocrat label, but it is a 45 rpm single. Which is all the buyer needs to know: all genuine Aristocrats were 78s. A Cash Box advertisement for Aristocrat 1105, from the March 5, 1949 issue. Courtesy of Dan Kochakian. 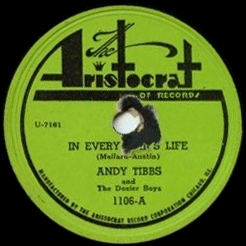 Aristocrat 3001 was a 78-rpm single released in April 1949. Many thanks to Marv Goldberg for reporting that "St. Louis Blues" shows U7157 on the label (not U7156 as claimed in previous sources; not a UB number, as was suggested in an earlier version of this page)—and that the accompaniment was provided by Sax Mallard's Combo. All previous discographies had either bailed on the accompaniment (like Ruppli) or (like various Sun Ra discographies) confused this session with the Dukes of Swing session below. Ruppli, Leadbitter and Slaven, and more recent sources like Lord's Jazz Discography have given matrix numbers from the Aristocrat matrix books. These did not specify what was actually released, and they were not always carefully compiled; the Aristrocrat master books omit the next session with the Dukes of Swing entirely. Add to this the fact that the two sessions had different accompaniment, and the same number ("Big Time Baby," which we now know was a Sax Mallard composition) was recorded at both, and you have a recipe for serious confusion. In fact, a purported reissue of U7159 on Classics 5028, Andrew Tibbs 1947-1951, is actually of UB 9545 from the next session, and Andrew Tibbs isn't on it. Our information on most of the recording groups led by Sax Mallard is woefully incomplete. The two issued sides included no horns, not even Sax Mallard's. The pianist sounds like Jimmy Bowman and Eugene Teague played his guitar on both of the issued sides. Bill Minor and Benny Cotton share the lead on "St. Louis Blues" and Bill Minor handles the lead by himself on "She Only." The Doziers actually sing, "She only fooledwith me." Whether Mallard or other horn players appeared on the two unissued sides, we have no way of knowing. This session took place at Universal Recording, Aristocrat's usual venue. The session was mastered after U7154 and U7155 by Leroy Foster (mastered November 30, 1948) and before U7164 through U7167 by Forest City Joe (mastered December 2, 1948). Allowing for some delay between recording and mastering, a mastering date of December 1 and a recording date in November 1948 seem indicated (see the Aristocrat discography for a complete chronological chart of recordings on the Arisocrat label). Discographies that include Aristocrat 3001 as a product of the session with the Dukes of Swing (see below, Doz 3) are incorrect. According to Cornell Wiley, the session with the Dukes of Swing followed the Tibbs session. If this is so, perhaps Aristocrat wanted to remake "Big Time Baby." Of the other three tracks from this session, two are instrumentals by the Dukes, and on "Music Goes Round and Round," the Doziers sing one opening chorus then let the band take over. The Dozier Boys: Eugene Teague (g -1, tenor voc); Cornell Wiley (tenor, baritone voc); Benny Cotton (bass voc); Bill Minor (lead tenor voc) -2; with Eugene Wright (b, ldr); Hobart Dotson (tp); Gail Brockman (tp); John Avant (tb); Frank Robinson (as); Roy Grant (as); Bill Evans [Yusef Lateef] (ts); Melvin Scott (ts); Van Kelly (bars); Herman "Sonny" Blount [Sun Ra] (p, arr); Robert "Hendu" Henderson (d). United Broadcasting Studios, Chicago, early December 1948. The session was split between two vocal tracks and two instrumental tracks, which are included for completeness. Although "Pork" was credited to Leonard Chess on the label, and "Dawn" to one "Crawfish," both appear to have been written by the band's music director, Sonny Blount (known after 1952 as Sun Ra). Aristocrat 3002 was a 78 rpm single, released in September 1949; see the Aristocrat discography. Personnel of the Dukes of Swing from Gene Wright (as interviewed, many years apart, by Otto Flückiger and John Szwed). According to the Szwed interview, the Dukes of Swing were a 11-piece band and everyone was present at this recording session. Sax Mallard is credited as the composer of "Big Time Baby" on the original label; the composer of "Music Goes Round and Round" is given simply as "Riley." Eugene Teague brought his guitar, which is briefly audible at the beginning of "Music Goes Round and Round." Bill Minor sings the lead on "Big Time Baby." Aristocrat used United Broadcasting occasionally (in fact, the very next session at the studio was by Reverend Dwight "Gatemouth" Moore, also for Aristocrat). Wright says the session took place not long before he left town to join the Count Basie band (an event that took place around Christmas of 1948). The Dozier Boys continued on and off in the Beige Room for over a year after the Dukes of Swing departed. In March 1949 they were at the Capitol Lounge in the Loop. Pat Harris, the author of the "Chicago Band Briefs" column in Down Beat, vented her displeasure at the Capitol's movement away from jazz bookings: "Dissolution of the Capitol... is complete with a collection of acts, which include the singing Dozier Boys, songstress Lee Johnson, and organist Milt Adler" (March 25, 1949, p. 4). But this was hardly the Dozier Boys' fault; they had already shown that they could work with jazz musicians. In October 1949 they were working at The Corner Lounge (formerly The Corner, formerly formerly Martin's Corner) with Jump Jackson and his Combo, Sundra Fields, and Tina Dixon. On their next recording session, they again played their own instruments and brought in a session pianist. Bill Minor (lead tenor, d); Eugene Teague (tenor voc, eg, arr); Cornell Wiley (lead tenor/baritone voc, b); Benny Cotton (bass voc); unidentified (p). Universal Recording, Chicago, December 12, 1949. The mattrix numbers and titles are from Lord's Jazz Discography. The date is from our Aristocrat discography. Aristocrat 409 was released at the beginning of February 1950. Just to keep collectors and discographers on their toes, it was the second such release. There was a first Aristocrat 409, consisting of two numbers by Floyd Smith (UB-9720 and UB-9721, recorded at United Broadcasting Studios on June 8, 1949, then sold to Aristocrat by the freelance producer John Coppage). Our thanks to the late George Paulus and to Tom Kelly for alerting us to this, er, interesting state of affairs. George Wright is probably correct in speculating that Floyd Smith was intended to appear on Aristocrat 408 (no records bearing that number have ever been found). By Feburary 1950, the Chess brothers had completely forgotten the Floyd Smith (they would reissue it on Chess 1439, after they'd changed the name of the label). "All I Need Is You" has reappeared on a bootleg LP, Yorkshir [sic] 781, Vocal Groups 1940's and 1950's Collector Series Vol. 1 (thanks to Armin Buettner for catching this one). A legitimate reissue followed in 1999 on Chess MCA 380-596, the 15-CD extravaganza titled The Chess Story 1947-1975. The composer credit comes from the Chess CD; composers aren't mentioned on the labels to Aristocrat 409. Another bootleg reissue is on Catch the Windy City Harmonizers: Unreleased & Rare Chicago R&B Vocal Groups -- The First Round (Power Vine 6082, a CD of Chess vocal group material released in 1999 and purportedly made in Indonesia). "She's Gone" was reissued in 1988 on The Best of Chess Vocal Groups (MCA/Chess CH2-6039, LP and CD); thanks to Andy McKaie for pointing this out. "She's Gone" was reissued for a second time in the 1990s on Roots RTS 33021, a Belgian CD titled Roots of Doo Wop. We still don't know who wrote this number. "Hey Jack" was probably issued for the first time in the Chess Rhythm and Roll box, CHD4-9352, which appeared around 1992. The liners to this set provide the exact recording date. "Hey Jack" is also on a bootleg LP of unknown date, Rarin' Records 777, Doo Woppin' the Blues -- Rare and Unreleased Recordings from 1949-1956 (thanks again to Armin Buettner for locating this item). Again, the composer is unknown. Bill Minor sings the lead on "All I Need Is You" and splits the chores with Benny Cotton on "She's Gone.". A listen to "Hey Jack" confirms the judgment that the Doziers were playing their own instruments. There was no U7225 from this session, as claimed in previous discographies; U7225 was by pop singer Penny Smith, from a session in January 1950. From May through July 1950, Cornell Wiley had a high-profile gig away from the Doziers; he worked each Saturday night as part of the all-star band on the Spotlight Talent Show (one hour weekly) that DJ Al Benson ran on Chicago TV station WBKB.. The house band consisted of Hotsy Katz (trumpet); Cy Touff (valve trombone); Andrew "Goon" Gardner (alto sax); Kenny Mann (tenor sax); Oett "Sax" Mallard (tenor sax); Claude Jones (piano); and W. B. "Sleepy" Nelson (drums); plus Wiley on bass. The first contract for the house band was in Wiley's name (posted with Local 208 on May 4, 1950), although in Cy Touff's account Sax Mallard was the actual leader. The Dozier Boys appeared regularly on the show, along with singers Joe Williams and Lurlean Hunter. On June 25, 1950, the Dozier Boys participated in the "Session in Progress: Ragtime & Swing" concert at the Beige Room, with Eugene Wright (back from the Basie band), Joe Williams, Floyd Campbell, George Freeman, and King Kolax. "Big Time Baby" was hyped as "the current rave" in the Defender ad. unidentified (tp -1); Harlan "Booby" Floyd (tb -1); unidentified (ts -1); Walter "King" Fleming (p); Bill Minor (lead tenor, d); Eugene Teague (tenor voc, eg); Cornell Wiley (lead tenor/baritone voc, b); Benny Cotton (bass voc). United Broadcasting Studios, Chicago, c. August 1950. Cornell Wiley and Benny Cotton identified the session pianist and trombonist. A trumpet player and a tenor saxophonist also pitched in on "You Got to Get It." They are just heard riffing in the background, so we have no clue who they were. Bill Minor sings the lead on "Pretty Eyes"; he and Benny Cotton alternate on "You Got." On September 16, the Doziers participated in the "4 Star Frolics," a midnight show at the 4 Star Theater (2418 West Madison). The other attractions were Luralean Harris, Viola Kemp, Eleanora King, the Four Starlites, the Edwards Sisters, "Flash" Evans, Rudy Williams, Jimmy Hill's Orchestra and DJs McKie Fitzhugh and Bud Riley. In October, they did Wednesday and Sunday matinees at Joe's Rendezvous Club, and worked the Chicago Defender 1950 Home Service Exposition. On October 28, they were at the Pershing Ballroom, doing a show with the Georgie Auld and Chubby Jackson Orchestras. In October 1950, Benny Cotton was drafted. To replace him, the Dozier Boys picked up Mifflin "Pee Wee" Branford, who was responsible for tenor vocals and guitar. Branford had played with the Cats and the Fiddle (from 1942, when he replaced Tiny Grimes, till 1948). "He was about eight years older than us and we looked up to him," Wiley said. Branford "was looking for a group to groom." In 1951, the Dozier Boys appeared on a number of occasions in St. Louis. Bob Koester recalls them working a "hillbilly" club. "Man they really loved us," Cornell Wiley said, laughing uproariously. "We were nervy!" An article in Billboard, November 1951, announced that the Dozier Boys had been signed by OKeh's Chicago operation. The others mentioned in the piece--White blues and ballad singer June Davis, balladeer Ray Orlando, and the Fritz Jones Trio--had already recorded for OKeh by the time it appeared. (June Davis and Ray Orlando were backed on their recordings by Red Saunders and his band; some of her material was released, but none of his was. By the time Fritz Jones' sides were issued, he had changed his name to Ahmad Jamal.) 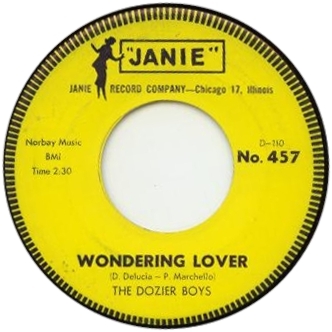 The Doziers had in fact recorded for OKeh, just before the announcement appeared, and they were duly advertised on the sleeves to other OKeh releases, but their tracks were never released. The Dozier Boys: Bill Minor (lead tenor, d); Eugene Teague (tenor voc, eg); Mifflin "Pee Wee" Branford (tenor voc, eg); Cornell Wiley (lead tenor/baritone voc, b). Columbia Studios, Chicago, October 25, 1951. These sides were mentioned in Ferdie Gonzalez's entries to Disco-File. Despite a fair amount of hoopla out of OKeh's PR department, they never saw the light of day. The second title sounds odd. However, Armin Büttner points out that the words "Suffer, no better for you" are prominent in "Hey Jack" from the group's December 1949 session. Since Aristocrat/Chess had not seen fit to release the title, the Doziers probably wanted to redo it for a new label. There is also a song by Philadelphia DJ Lloyd "Fatman" Smith called "No Better For You"--the musicians chant "Suffer, no better for you" after each line in each stanza-- so obviously the phrase enjoyed some currency at one time. Since the Doziers' lineup at this date consisted of two guitars, bass, and drums, it seems likely that a session pianist was added, but there is no way to tell without hearing the sides. Cornell Wiley recalls that OKeh's A&R man, Ed Kissak, thought "we sounded too White." During their brief association with OKeh, the Doziers met Fritz Jones, later to become famous as Ahmad Jamal. Willie Minor and Mifflin Brantford [sic] appeared before the Board requesting permission to join Local 208. Both stated that they have been playing traveling engagements with the Dozier Boys. They also added that they reside in Chicago, but hold membership in other locals. The Board let them in, in return for a cash payment of $54. The Dozier Boys' recordings for United have turned out to be unexpectedly complicated. 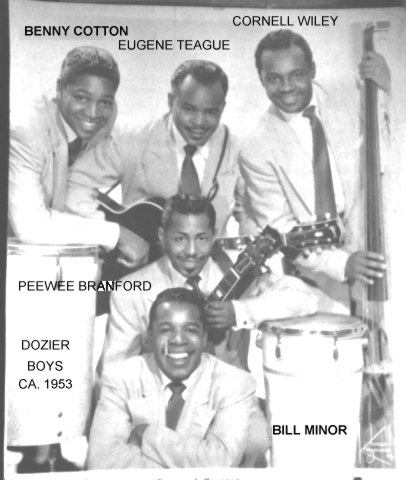 The Doziers signed with United in August 1952, when they were still a quartet of Bill Minor, Eugene Teague, Pee Wee Branford, and Cornell Wiley. A September 1952 release was announced, but then nothing happened. In fact, their signing was re-announced in February 1953, then followed by releases in March and November 1953. Apparently (this is Benny Cotton and Cornell Wiley's best recollection) the four-man Doziers group actually did record four sides in August 1952. (Benny Cotton recalls that the four titles in Doz7 had already been recorded without him when he rejoined the group.) But for some reason the sides were not deemed ready for release at that time (perhaps Leonard Allen and Lew Simpkins decided to overdub additional instruments, such as Tab Smith's alto sax?). So two further sessions were held at United on January 15 and 22, 1953. By this time, Benny Cotton had been discharged from the army and the Dozier Boys had expanded to a quintet. A further complication is that Benny Cotton did not originally play an instrument. After his discharge from the Army, he took up the guitar, but wasn't able to keep up with Teague and Branford, so he switched to the tipple, which is a lot quieter. He eventually took up the drums, but only after Bill Minor quit the group. The two January sessions were used to record four entirely new sides and to dress up the four that had been recorded in August 1952. Talmadge "Tab" Smith (as except -1); unidentified (p); Bill Minor (lead tenor voc, d); Eugene Teague (tenor voc, rhythm eg, arr); Mifflin "Pee Wee" Branford (tenor voc, eg); Cornell Wiley (lead tenor / baritone voc, b). 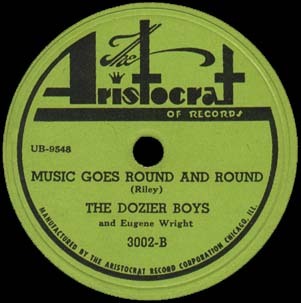 Though the items have nonconsecutive master numbers, Benny Cotton has stated that these four tracks were recorded before he rejoined the Dozier Boys. Since the Dozier Boys' signing was announced by United in August 1952, this is presumably when the recordings session took place. There's been some question whether Tab Smith was present for this session, or his alto sax was overdubbed at a later date. However, the alto sax work on such numbers as "Laughing in Rhythm" would have been hard to overdub. Overdubbing on another instrument is actually more likely. For instance, some of the drumming, or even the session piano. "Linger Awhile" is strictly a group vocal. "Laughing in Rhythm" has a lead by Eugene Teague (and Bill Minor as a second lead). "Do You Ever Think of Me?" is a group vocal. "Just My Speed" had a lead by Cornell Wiley. United 143 was a single released in March 1953. P-Vine Special PLP-9044, Blazes & Dozier Boys: Swingin' & Singin', was releaed in Japan in 1982. It is just as well that P-Vine took the initiative after licensing this material, because in some cases the P-Vine release significantly pre-dated the Delmark release. In this case, the material has never appeared on Delmark. Talmadge "Tab" Smith (as except -1); unidentified (p); Bill Minor (lead tenor voc, cga -2, d); Eugene Teague (tenor voc, rhythm eg, arr); Pee Wee Branford (tenor voc, eg); Cornell Wiley (lead tenor/baritone voc, b); Benny Cotton (bass voc, tipple). Universal Recording, Chicago, January 15, 1953; * indicates an overdub or remake on January 22. United 143 was a 78-rpm single released in March 1953; United 163 followed in November of that year. Basic information about the sessions comes from Bob Koester's discography, "The United/States Masters" (Blues Unlimited, No. 123, Jan/Feb 1977). Koester's discography does not include personnel. Lord lists only the Doziers (without naming any individuals) and unknown accompaniment (this is commonplace with discographers who don't realize that the Dozier Boys accompanied themselves). The Mohr-Flückiger-Demeusy files mention United 143 and hypothesize that the alto sax might be Tab Smith. MFD were right about the saxophonist—he is definitely Tab Smith, playing the same role on these sides that Eddie Chamblee did with the Four Blazes. Bill Minor must have played the congas that are so prominent in the 1952 photo: on the one occasion that congas can be heard on this session, trap drums are not. The complete personnel for this date was provided by Cornell Wiley and Benny Cotton, except for the session pianist, who has not been identified..
"Early Morning Blues" splits the lead chores between Cornell Wiley and Benny Cotton, while "Cold, Cold Rain" is Bill Minor's responsibility. "I Keep Thinking of You" has a lead by Cornell Wiley. According to Wiley, the unissued "Jitterbug Waltz" was an instrumental that featured Pee Wee Branford's guitar. Koester has "Linger Awhile," "Early Morning Blues," and "I Keep Thinking of You" being remade at the January 22 session. However, Koester does not mention the August 1952 session. Koester says that the last three tracks (which Lord and others attribute to a separate session on January 22) were also initially cut on January 15, 1953. Their original master numbers were 1188, 1189, and 1190, indicating that they were first attempted at the end of the January 15 session. Koester says that three were remade on January 22, and all issued versions of "Cold Rain" and "Do You Ever" are from the second session. In fact, the master numbers are out of order and the "remakes" at the January 22 session consisted most probably of overdubbing to enhance the August 1952 tracks. Meanwhile, though, 1188 through 1191 had been assigned to four tracks by Jimmy Hamilton that had been recorded for States in Detroit, so master numbers 1192, 1193, and 1194 had to be used for Doziers material. P-Vine Special PLP 9044 was a Japanese release of United-derived material that appeared in 1982. The title was Black Music of the 50's Volume 12: Blazes & Dozier Boys, Swingin' and Singin'. It contained a total of 6 tracks by the Doziers and 6 by The Four Blazes. The P-Vine compilers used Koester's discography and incorrectly listed "Linger Awhile," "Early Morning," and "Cold, Cold Rain" as previously unissued; the takes used on the P-Vine LP appear to be the same ones that were used on the original issues. The P-Vine also gives "Woke Up One Early Morning" and "Cold Rain Is Falling" in place of the titles as released on United 163. United U-114, Rare Windy City R&B & Early Vocal Groups Vol. 3, is a bootleg CD released in 1997. It reproduces the contents of the P-Vine LP, adding further sides by the Four Blazes, plus two by Helen Thompson, one by Gloria Irving with the Swinging Sax Kari Orchestra, one by Tommy Dean and his Gloom Chasers with Jewel Belle, and one by Paul Bascomb. The P-Vine release lists take numbers; the United boot and the previous discographies do not. However, the takes used on the United bootleg are identical to the takes on the P-Vine release; the first 12 tracks of the United were dubbed straight off the P-Vine, then resequenced. Moreover, in general the P-Vine issues of United/States material rely on Koester's discography and do not always provide reliable information about what was released at the time. As always with United/States material, there is variation in the titles. The four titles that were released on United single are listed in our two entries as they (supposedly) appeared on the labels (according to Ferdie Gonzalez's entries in Disco-File). Bobby Blevins recalls Cornell Wiley complaining about record companies leaving Dozier Boys material on the shelf. No doubt this was a reference to the tracks left unreleased by Aristocrat/Chess, OKeh, United, later on by others. While in town, the "Five Dozier Boys," as they were now billed in Chicago, played Martin's Corner (formerly The Corner, etc. etc.) along with Tiny Davis and her Hell Divers. After their United recordings appeared, the Dozier Boys went on a tour, the "Hollywood in Harlem Revnue," with Pigmeat Markham and Timmie "Oh Yeah" Rogers. This took them to the W.C. Handy Theater in Memphis, Tennessee. While this was predominately a black theater, there was a show given on Monday nights for white audiences. At some point in 1953 or 1954, there was a death in Pee Wee's family and he had to return to Chicago. He lined up a replacement in Indianapolis: Wes Montgomery. Montgomery remained in the group for just a few weeks, until Pee Wee was able to return. In 1955, the Dozier Boys were awarded first place after singing "I Ain't Got Nobody" on the Arthur Godfrey Talent Scouts Show. The full story will be told in Marv Goldberg's forthcoming article in Discoveries. Suffice it to say that the Dozier Boys were indeed "nervy" as well as talented. After their successful appearances on the Godfrey Show, the Doziers made a session for ABC/Paramount. Nothing was ever released, and Cornell Wiley does not recall the titles. Bill Minor (lead tenor voc, d); Eugene Teague (tenor voc, rhythm eg, arr); Pee Wee Branford (tenor voc, eg); Cornell Wiley (lead tenor/baritone voc, b); Benny Cotton (bass voc, tipple). Whether session musicians were added is of course unknown. It is possible that the only session that the Doziers really did for ABC Paramount was the one in 1958, for the company's APT subsidiary. See below. In 1956, there was a fair amount of turnover. Pee Wee Branford left the group (he later joined a group called 3 Sharps and a Flat). His replacement was non-singing pianist Truxton Kingslow. Then Bill Minor got married and left the group; the Doziers replaced him with Frank "Red" Bell, who sang in a high tenor and played tenor sax; he was around 17 at the time. When Minor left, Benny Cotton began to play the drums, which were his instrument from then on. During an extended engagement in Rochester, Minnesota, Truxton Kingslow fell in love with a local girl, got married, and didn't want to leave. Frank Bell recommended Joe Boyce, a non-singing vibes player who was only 19 at the time. Boyce auditioned on December 14, 1956, and was playing a gig at the Key Club in Minneapolis two days later. Boyce recalls, "We played the best clubs in medium-sized towns and the second-best clubs in big towns." For about six months, the group changed its name to the Bel-Aires; this name does not appear on any of their recordings. By the time their next record was released, they had reverted to The Dozier Boys. The Dozier Boys in 1957. Back, from left: Benny Cotton, Joe Boyce, and Cornell Wiley. Front, Eugene Teague and Frank Bell. Frank "Red" Bell (high tenor voc, ts); Joe Boyce (vib); Eugene Teague (tenor voc, eg, arr); Cornell Wiley (lead tenor/baritone voc, b); Benny Cotton (bass voc, d). An October 26, 1957 article (with large group photo) in the Chicago Defender (p. 24) promoted a new release by the 5-man lineup. The Defender was not paying much attention to the Dozier Boys during this period, and the article was obviously placed by the band's agent, Donald DeLucia "of Don-Del Music in Chicago's Loop." 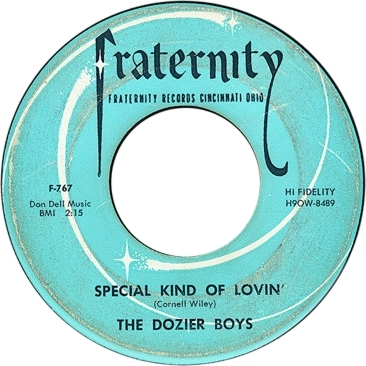 "Special Kind of Lovin'" came out on Fraternity Records, a small company out of Cincinnati that continued to operate well into the 1960s. Both sides of the Fraternity feature Cornell Wiley's lead. In the photo, Wiley holds an electric bass, but he appears to be playing a string bass on the record. The matrix numbers indicate that the record was mastered and pressed by RCA Victor in 1957 (note the H prefix). Fraternity used RCA Victor's services on a regular basis from 1956 through 1963. Interestingly, the matrix numbers aren't contiguous in the series, indicating that "Early Morning Blues" was probably made at an earlier session (or at least sent out for mastering earlier). We do not know whether the Dozier Boys cut any further tracks for Fraternity; if there are any, they remain untraced. In February 1958, Joe Boyce left to return to college, as had been arranged when he joined the group. Non-singing pianist Pete Hatch replaced him. Hatch, in turn, was replaced by pianist Bobby Blevins. The brother of guitarist Leo Blevins, Bobby had been on the Chicago scene for several years by this time. He served in the Army from 1951 to 1953 (his return to Chicago and reinstatement with Local 208 were mentioned in the Board meeting minutes of October 15, 1953). He subsequently landed some club gigs as a leader, becoming known as "Jazzy" Blevins. From October 1957 through January 1958 he was a regular member of the combo led by bassist Cool Breeze (aka Joe Bell) and probably appeared on Breeze's two singles for Mayo Williams' Ebony label. Blevins probably left the Breeze outfit when it finished its run at Sid's 3022 Club in January 1958. By May, Cool Breeze had settled into a gig at Club 34 with a new lineup. During this period, Eugene Teague and Dave Barber (of the Four Freshmen) were responsible for the group's arrangements (which had to be frequently revised, with all the personnel changes). Frank "Red" Bell (ts, voc); Bobby Blevins (p); Eugene Teague (tenor voc, eg, arr); Cornell Wiley (lead tenor/baritone voc, b, arr); Benny Cotton (bass voc, d); unidentified female (voc -1). This single was released in September 1958 (and reviewed in Billboard on October 6). Thanks to Bill Daniels for the matrix number information. Both sides featured Cornell Wiley's lead. APT was a subsidiary of ABC-Paramount; it was in business from 1958 through1965, then was revived in1969-1972. APT brought in a female singer who did the vocal intro to "I Am So" along with Benny Cotton. Eric LeBlanc reported a track by the Doziers titled "My Heart Is You" on a various artists CD put out by Chicago Records (the CD title is Annette & Rendezvous - Moonlight). Probably the same as "My Heart Is Yours"; but it still needs to be investigated. In 2000, "I Am So" appeared on a various-artists CD APT 1002, The Best of APT Records Vol. 2; "My Heart Is Yours" appeared on its companion volume, APT 1001, The Best of APT Records Volume 1. These collections (we are reasonably sure they are bootlegs) feature doowop groups primarily. The cover to APT 1001 includes a publicity photo of the Dozier Boys in 1953, obviously shot in the same studio as the one we have reproduced above. Disaster struck not long after the APT session, when Eugene Teague collapsed and died during a performance. Teague had kidney problems and during a gig in Louisville, he felt too sick to join the group onstage. When the group began to play without him, he thought they were playing especially well and came up on stage to join them. He played a single number with them, sat down on a chair, and died of kidney failure. The group did little for the next six months. Teague had done most of the arranging in the early days. Now the job was in Cornell Wiley's hands; he trained new members of the group and also handled some of the bookings. The group was still getting work. A blurb in Cash Box (February 7, 1959, p. 28) noted that they were in Chicago at Club Laurel. Bobby Blevins came and went from the group. When he was not available, sometimes the Doziers went on as a trio, and sometimes they replaced him with guitarist Ben White. Frank "Red" Bell (ts, voc); unidentified (vib); Bobby Blevins (eg); Cornell Wiley (lead tenor/baritone voc, b); Benny Cotton (bass voc, d). Janie Records was based in Chicago. Our information comes from a copy in Robert Pruter's collection. Cornell Wiley sings the lead on both sides. There is a prominent vibraphone part on both sides, but Joe Boyce was no longer in the group by this time, and according to Wiley and Cotton, the vibes were played by a session musician. Since Blevins played guitar as well as piano, it is reasonable to assume that he had changed instruments after Eugene Teague's death. The title of side A may be written as "Wondering," but the lyrics indicate that it is "Wandering Lover." Listed as co-composer of this tune was the band's agent, Donald DeLucia. 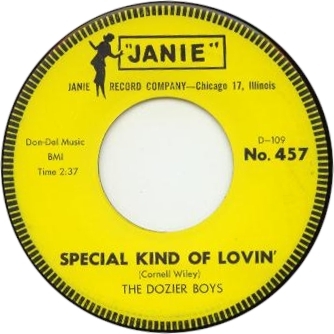 "Special Kind of Lovin'" is the Doziers' (moderately successful) take on rock and roll. But it would have seemed quite dated to a record buyer in 1960. There has been a good deal of perplexity about the date, but it seems that the last Dozier Boys recording took place around 1964. 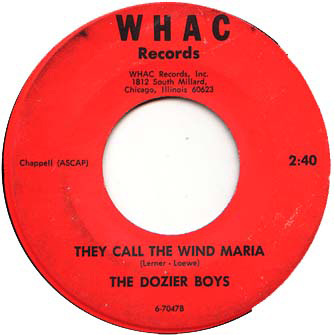 The group is still identified as The Dozier Boys on the label. The address on the label (1812 South Millard in Chicago) has a zip code, which places it after July 1963, when such things were introduced. Bobby Blevins (p); Frank "Red" Bell (high tenor voc); Cornell Wiley (lead tenor/baritone voc, b); Benny Cotton (bass voc, d); poss. other musicians. WHAC 6-7047 was a 45-rpm single, probably issued in 1964. The correct title for the B side (with Benny Cotton in the lead) is "They Call the Wind Mariah." "Someday You'll Be Sorry" (lead by Cornell Wiley) was a song associated with Louis Armstrong (the label credits him with composing it). Apparently Bell's tenor sax is not heard on either side. By the mid-1960s, the Dozier Boys were questioning their name again. They moved with the times and began calling themselves "The Moving Times." In 1967, they were contacted by the US Army, which wanted more Black entertainers with the USO in Vietnam. Neither Frank Bell nor Bobby Blevins wanted to go, so they were replaced by Clifford Scott (tenor sax, trumpet, piano) and Jerry Hubbard (guitar, tenor vocals). The Vietnamese government opened a program to train Vietnamese entertainers, and the Moving Times were hired as teachers; they lived in Da Nang for a time. There are no Moving Times recordings. The group returned to the United States in 1970 and changed their name back to the Dozier Boys. They played a few gigs, but the music at home had changed too much and, "Everything went downhill. We couldn't get back what we had." Cornell Wiley and Benny Cotton decided to disband the group after 24 years. 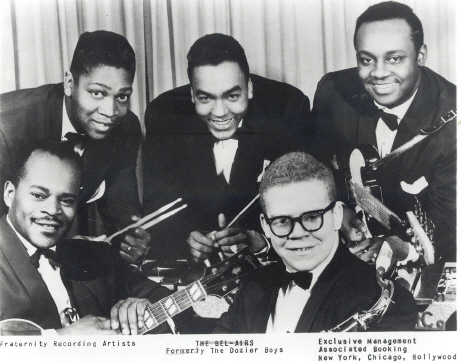 The Dozier Boys spanned a quarter century of popular music history. Not only did they sing standards of all sorts on request, they performed everything from strict Swing-era vocal harmony ("Laughing in Rhythm," which began as a Slim & Slam number in 1938, and "Linger Awhile") to true doo-wop of the rock and roll vintage ("Special Kind of Lovin'"). As most of their music was not exactly jazz, and not exactly doo-wop, they have been given sketchy treatment by jazz discographers (Tom Lord's Jazz Discography quits in 1953) and ignored by most doo-wop chroniclers (they are never mentioned in Gribin and Schiff's encyclopedic volume Doo-Wop: The ForgottenThird of Rock 'n Roll). Today Cornell Wiley lives in Ohio. He has worked with the Bob Allen trio since 1973, and teaches the string bass at Dennison University. Recently, he released a CD titled Cornell Wiley + 5, which features a supper-club jazz group with himself on vocals. Benny Cotton lives in Minnesota. He retired from the Minneapolis bus company in 1993, and has worked for the last 10 years with the Impromptus--a polka band. Bobby Blevins lives in Los Angeles. Joe Boyce lives in Westchester County, New York. After police work and many years in journalism, he is a Senior Editor for the Wall Street Journal. Bill Minor and Jerry Hubbard are still alive; it is not known whether Ben White and Clifford Scott are still around. At some point in the 1960s, Pee Wee Branford fell two stories and broke his back; he was so depressed about becoming paralyzed that he committed suicide. Frank Bell, Lucius Teague, Wes Montgomery (1925-1968), Pete Hatch, and Truxton Kingslow are all deceased. We have had the good fortune to talk to four surviving members of the group: Cornell Wiley (interviewed by Marv Goldberg); Benny Cotton (interviewed by Goldberg), Joe Boyce (interviewed by Goldberg) and Bobby Blevins (interviewed by Robert Campbell). Without their help, we would know far less about these sessions, and nothing about the group's lineup changes over the years. Many thanks to Bob Pruter for his research contributions, to Neil Hirsch for some composer credits, and to George Moonoogian for dubs of Aristocrat 3001 and Chess 1436. Marv Goldberg's email address is marvy42 AtSiGn att dOt net.